Mentality Proper is described as a red toned metallic holographic nail polish. The formula was great and it was almost a one coater. Two coats were used to even out each nail. Proper dries to a satin finish. Mentality Sly is described as a bright magenta pink holographic nail polish with blue and purple duocrome flashes. You may remember this shade from my last breast cancer awareness mani. Sly is a very flattering shade of pink. Two coats were used for opacity. 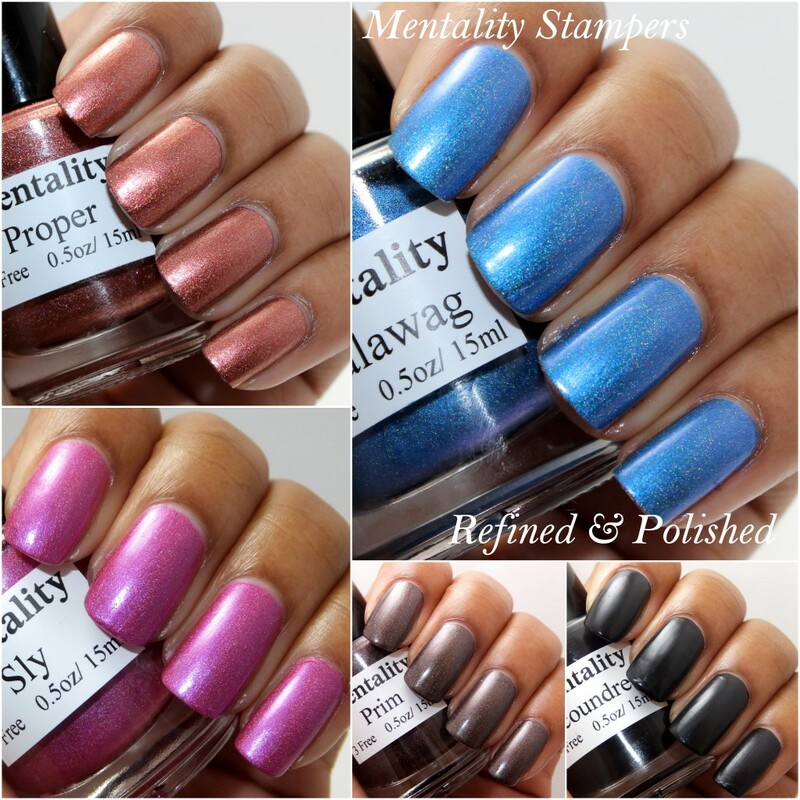 Mentality Scalawag is described as a deep, bright blue holographic nail polish. The formula was a little thinner than the others shown here, but was still opaque in two coats. Scalawag was not runny and I had no problems applying it. I love shades of blue like this one. Mentality Prim is described as a dark espresso holographic nail polish with a slight metallic finish. The formula was great and applied easily. Prim dried to a satin finish and was opaque in two coats. Mentality Scoundrel is described as a semi gloss black. The formula applied very easily, but this is one of those shades that shows every imperfection in your nails. Base coat is a must if you plan to wear Scoundrel as a full mani. Two coats were used for opacity. As mentioned, I’ve only used one of these polishes for stamping, but I’ve heard from many others how amazing they are. I think my learning curve for stamping is just much longer because I don’t do it often. One of these days, I’ll try to practice some more. I’m probably just kidding myself by thinking that will happen though. The Mentality Stampers collection can be purchased here for $7.50 each.